I am not yet a strong tweeter...I am improving my skills though in it. With that said though, I do believe that I am smarter than a 5th grader though. 6th grader? Debatable. Honey, you are totally on a Junior High level. No question. I followed you! Actually, I don't know what it means to follow someone, but I clicked the button that said follow. Yea! Breakfast cookies with ham for all. You are liking "Everything is Fine"? I have it (thanks to Bree :)) but I haven't started it yet. Since it doesn't have a return to library date on it I have been putting it down on the list. Word Count: 0 :) Perhaps my numbers will improve by 10 X tomorrow. 10 X 0=0 Yahoo, already there. Check. Good luck with your word count. I went to a signing/talk last night with Shannon Hale. She said she sets herself a words per week (I think hers was 5000 which is high but maintainable she said). I'm not a tweeter but that message is funny. I think it's subliminal for sure. Just what are they trying to get the world to do? Emily- Way to go! I can't wait for those delicious ham and pea breakfast cookies. Cam- I liked it, but it definitely is not your run-of-the-mill typical light teenage fluff. Deb- Can't wait to see what your word count is next week. I expect it to keep climbing! That error message with graphic is another reason for me to avoid Twitter. It shows how seriously disturbed the whole thing is. When I look at that picture, it reminds me of the Wily E. Coyote cartoons. 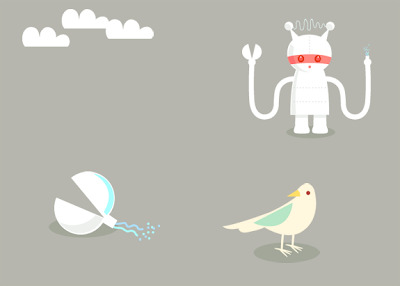 But this should be called Robot vs Twitterbird. Una- Lol! I looked closer, and the little bomb has "ACME" printed on it. Unfortunately they do not have the U of U yet, but maybe if you made a special request they would make one thyat sings "I'm a Utah Man" for you. My favorite part is in the story section "Joe redesigned and decorated her potty chair with the university’s emblem and encouraged her to “Go Potty Like A Champion.” She knew she could Score "Touchdown” with her dad when she was cheered on the same way crowds cheered on her family’s favorite college team." I am on my 6th page of my book Woooooooooh! Lily- Congratulations! It all starts somewhere, right?